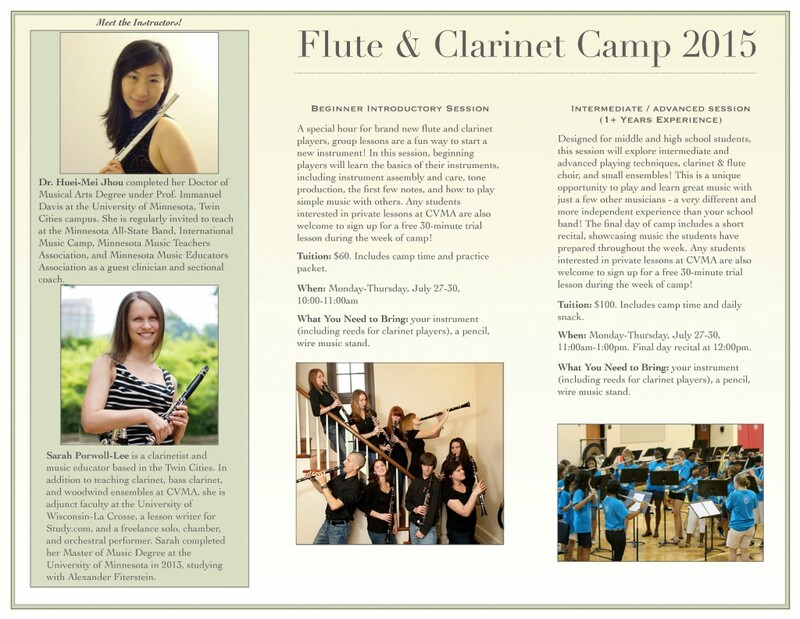 ﻿ Flute Camp July 27-30 in Saint Paul! A special hour for brand new flute and clarinet players, group lessons are a fun way to start a new instrument! In this session, beginning players will learn the basics of their instruments, including instrument assembly and care, tone production, the first few notes, and how to play simple music with others. Any students interested in private lessons at CVMA are also welcome to sign up for a free 30-minute trial lesson during the week of flute and clarinet camp! Tuition: $60. Includes camp time and practice packet. What You Need to Bring: your instrument (including reeds for clarinet players), a pencil, and wire music stand. Designed for middle and high school students with at least 1+ years experience, this session will explore intermediate and advanced playing techniques, clarinet & flute choir, and small ensembles! This is a unique opportunity to play and learn great music with just a few other musicians – a very different and more independent experience than your school band! The final day of camp includes a short recital, showcasing music the students have prepared throughout the week. Any students interested in private lessons at CVMA are also welcome to sign up for a free 30-minute trial lesson during the week of flute and clarinet camp! Tuition: $100. Includes camp time and daily snack. When: Monday-Thursday, July 27-30, 11:00am-1:00pm. Final day recital at 12:00pm.